Bicuspid aortic valve (BAV) is a defect of the aortic valve that is present at birth. The aortic valve allows oxygen-rich blood to flow from the heart to the aorta. The aorta is the major blood vessel that brings blood to the body. Normally, there are three valve flaps (leaflets) in the aortic valve. In a person who has a bicuspid aortic valve, there are only two valve flaps (leaflets) in the aortic valve. Valves are passages for the blood to pass through before leaving each chamber of the heart. The valves prevent blood from flowing backwards into the heart. How prevalent is bicuspid aortic valve? What are the characteristics of bicuspid aortic valve? How is bicuspid aortic valve managed? 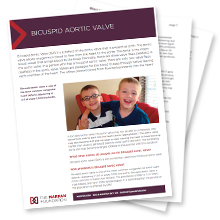 Find these answers and more in the "Bicuspid aortic valve (BAV): What you need to know" download.